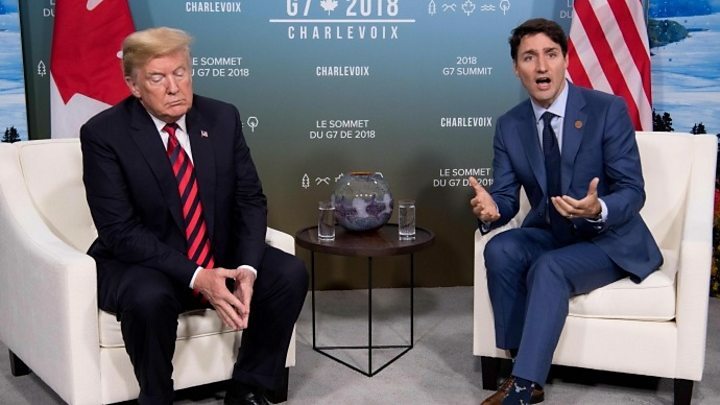 Media captionMichelle Erickson-Jones: "We definitely want to get back to free trade"
On the Great Plains, the harvest is coming to a close and she is cutting the very last of this year's wheat, rattling across a golden field in a combine harvester which bristles with technology. Farming here in Montana is a hi-tech business with a global market. The most important customer for this farm is not a bakery in the nearest village but the world's third largest economy, Japan. "We spent decades building that market," she says. "America is tired of getting ripped off," said the president at a rally in Montana on Thursday night, showcasing the blunt language which helped him into the White House. "We're going to get a great deal for our farmers and ranchers and factory workers," he added. And yet this popularity comes despite, not because of, Mr Trump's approach to trade. It is a paradox which is not easily explained in a state where agriculture is by far the leading industry. On his third day in office, as he had promised during his campaign, Mr Trump pulled the US out of the nascent Trans-Pacific Partnership (TPP) which would have been the largest trade deal in history, covering 40% of the world's economy. His predecessor Barack Obama had envisaged the pact as a central plank of an American "pivot to Asia" with the aim of drawing countries around the Pacific Rim together in a fair, rules-based system, a challenge to China's statist capitalism. "We have roughly 50% of Japan's market share right now," says Ms Erickson-Jones. "It's definitely something we wanted to continue and even expand and without being involved in TPP we expect to lose about half of that market share." Farming is entwined in this country's identity, its spacious skies and amber waves of grain celebrated by patriots who extolled the New World as a land of plenty. 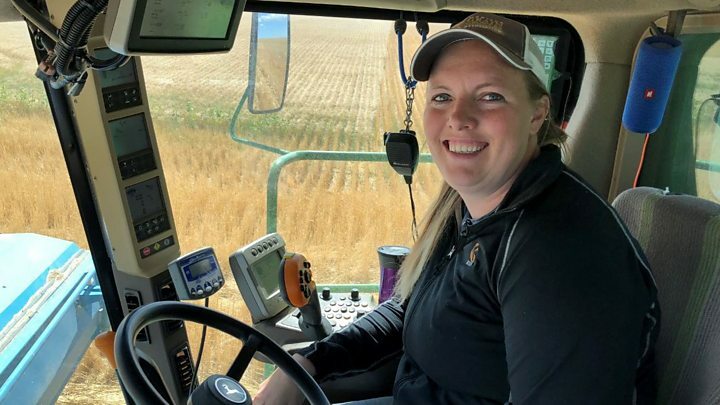 "Seventy five per cent of our wheat is exported," says Ms Erickson-Jones, the fourth generation of her family to farm land near Broadview in south central Montana. The White House denies it is protectionist, insisting instead that it is using its economic might to force China to abandon "trade-distorting practices" such as unfair state subsidies; restrictive rules for foreign companies operating in the country; and the theft of US technology. Peter Navarro, a senior White House adviser on trade and industrial policy, wrote in April that Beijing had "broken every rule in the book" as its economy expanded at a time when the US was losing factories and jobs. But while she applauds the idea of taking on Beijing she would like to see an emphasis on "expanding our markets," including a plan to rejoin TPP. Montana's Democratic Senator Jon Tester says he too accepts the president's diagnosis of the problem with China but insists that he would have tried a different solution, forming an international coalition to put financial sanctions on Beijing, which he calls "a bad actor," which steals technology and manipulates currency. Mr Tester, a farmer himself, says he remembers with dread the early 1980s when the US government stopped its farmers from selling grain to the Soviet Union (a policy enacted by a Democrat, Jimmy Carter, in response to the USSR's invasion of Afghanistan and ended by a Republican, Ronald Reagan). "I was on the farm in the 1980s... and I saw my neighbours leave in droves," he says. "So the tariffs scare me. They scare me bad." Mr Tester is campaigning for re-election in November's mid-term elections in the shadow of Yellowstone National Park - deep in Trump territory. "If we don't have those foreign markets, we are literally dead in the water in production agriculture," he warns. "Glad we have Trump to properly stand up for ourselves and maybe make a better deal for us," says Corey Forman, who hides a broad grin under a shaggy red beard and a black and white baseball cap which advertises farm loans. Phil McVey is also in the audience, well-prepared for the evening's entertainment in four layers of shirts and jackets topped off with a smart light-brown cowboy hat. "American farmers need help," he admits before adding quickly "and whatever he [Trump] can do to help us, its fine." "He'll do the right thing. We like him." There is a great divide here between the protectionism in Washington and the free trade preferred by farmers but it doesn't seem to be eroding support for the president. When I ask whether her farm will survive her answer - "I hope so" - is delivered with a laugh which does not sound especially reassuring. "Nothing's certain in farming, so no, I'm not totally sure but we're OK for a couple of years," she continues. "A lot of my concern is based on how long it's taken us to build these markets. It's easy to tear them down and tearing them down has a pretty big impact on the future of my kids' ability to farm. "We definitely want to get back to free trade."